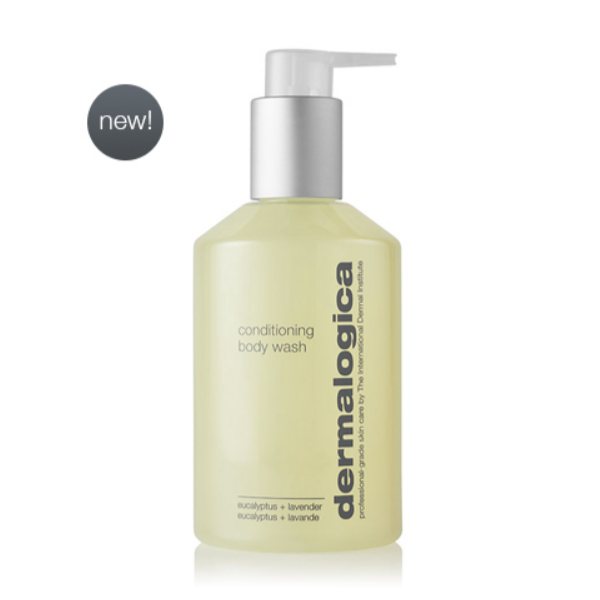 Dermalogica Conditioning Body Wash 16oz. A rich, skin-conditioning botanical cleanser for the entire body. Soap-free Quillaja Saponaria extract thoroughly cleanses the skin, leaving it feeling soft and silky. Essential oils of Tea Tree, Lemon, Eucalyptus and Rosemary gently purify without stripping the skin's own natural moisturizers. The soothingly fragrant essential oils of Sandalwood, Lavender, Orange and Clary Sage moisturize the skin, leaving it smooth and conditioned. Contains no artificial fragrance or color. Professional recommendation advised. Body wash has delightful fresh smell. I have been using this wash by Dermalogica for over 15 years exclusively, never use soaps! This is the best wash ever, the smell is invigorating and fresh and leaves my skin clean without drying.Love it and will never change body wash.
Love, love love this body wash! Love it, only body wash we use in our home. Perfect. One of the only soaps I can use that doesn't dry my skin and make me itch. Smells nice, rinses off easily. I buy the giant containers, and fill small ones for shower, travel, etc. I have been using the body wash for years. It has a lovely light fragrance and is very gentle and mild. This body wash is a total treat! You only need a little bit and your skin will feel very smooth. Typically I do not like scented products but the natural "cedar" scent is an awesome way to wake up. Thank you for having the best price on this quality product. What a refreshing way to start the day! I enjoy the fragrance, but most of all the wonderful hydrating and restorative effect it has on my skin. I have used it for years. Quillaja Saponaria Bark Extract, Sodium Laureth Sulfate, Disodium Laureth Sulfosuccinate, Cocamidopropyl Betaine, Lauramide DEA, Glycol Distearate, Steareth-4, Essentional Oils of: Santalum Album (Sandalwood), Lavandula Angustifolia (Lavender), Citrus Aurantium Dulcis (Orange), Lavandula Hybrida, Amyris Balsamifera Bark, Cedrus Atlantica (Cedarwood) Bark, Salvia Sclarea (Claryl), Pogostemon Cablin (Patchouli), Cananga Odorate (Ylang Ylang) Flower, Eucalyptus Globulus Leaf, Citrus Medica Limonum (Lemon) Peel, Rosmarinus Officinalis (Rosemary) Leaf, Melaleuca Alternifolia (Tea Tree) Leaf; Lavandula Angustifolia (Lavender) Extract, Sodium PCA, Citric Acid, Panthenol, Butylene Glycol, Quaternium-75, Methyl Gluceth-20, Tetrasodium EDTA, Benzyl Alcohol, Methylparaben, Propylparaben.